Eastern Black Swallowtails are commonly seen east of the Rockies into Arizona and Mexico. 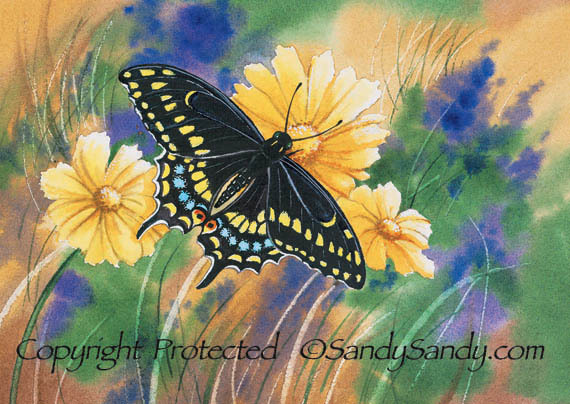 Over twenty species occur in the United States.Often spotted in meadows and gardens, this butterfly is particularly fond of Clover, Queen Anne's Lace, plants of the carrot family and cultivated flowers. Sometimes their caterpillars can become destructive garden pests. Swallowtails can be difficult to observe at close range. Although it drifts lazily from vegetation to flower, when approached it will take off at high speed in a straight line. The Native Americans see the butterfly as a symbol of change and joy. As a representation of transformation and growth, the butterfly teaches that change is inevitable, but it does not have to be traumatic.